On May 13 - 14, 2011, Tyler Perry will be performing live at the Cobb Energy Center in the Atlanta Metropolitan area for three performances. 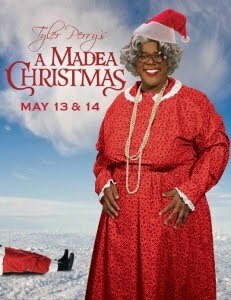 The play is called 'A Madea Christmas' and it will be taping live for video. The tickets are only $25. There are a group of sisters lamenting the "dumbing down" of black film and cinematography, over at What About Our Daughters blog, and I agree. The ladies are saying that black film is now graded on a "Tyler Perry curve" and that's a good description, because now we have this Jumping the Broom film, which I won't see, not even on Netflix. Why is everything Madea? I am so damned sick and tired of Madea! She's waaaay overexposed!!! I want to see a softer, gentler black grandma! They DO exist!